Hydrates intensely and maintains hydration. 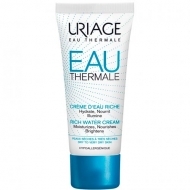 DESCRIPTION: Eau Thermale Masque dEau Nuit from Uriage is a mask, which helps to moisturize and revitalize intensely for a rested skin. Soak the skin in a thermal bath. It hydrates intensely and maintains hydration. 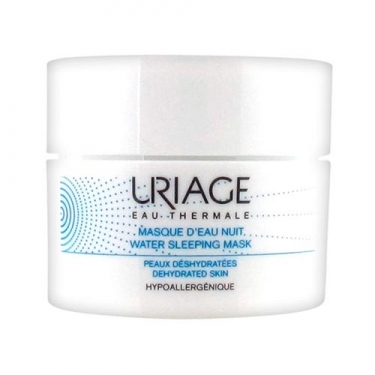 In effect "sleep of beauty", revitalizes the complexion. 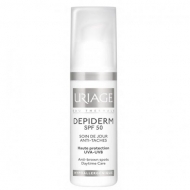 Ultra-light gel texture with Hydra-Thermal complex, hyaluronic acid and edelweiss extract for a moisturizing, soothing and revitalizing action. In the morning the skin becomes softer, nourished and radiant. Complete Formula: Aqua (Water, Eau), Butylene Glycol, Dimethicone, Glycerin, 1-2-Hexanediol, Squalane, Ammonium Acryloyldimethyltaurate/VP, Copolymer, Xylitylglucoside, Trehalose, Urea, Anhydroxylitol, Chlorphenesin, Xylitol, O-Cy-Men-5-Ol, Pentylene Glycol, Serine, Parfum (Fragrance), Sodium Hyaluronate, Glucose, Algin, Caprylyl Glycol, Disodium Phosphate, Glyceryl Polyacrylate, Pullulan, Alcohol, Leontopodium, alpinum Flower/Leaf Extract, Potassium Phosphate, CI42090 (Blue 1), Citric Acid, Sodium Hydroxide. Let it act overnight before rinsing thoroughly.